The disciples of Christ, they are known for it. It is their number one defining characteristic. Love. It oozes from every cell in their body. Love for one another. Love for each other. Jesus himself spoke these words. He gave the direction love one another as I have loved you. It is such a short statement that it seems it would be easy to recognize, but how do we really know. What does this kind of love really look like? Today I finished reading a book called Divine Secrets of Mentoring: Spiritual Growth Through Friendship by Carol Brazo. It is an awesome book and I highly recommend it. In the last chapter of the book one line popped out at me. It caught my attention like a giant flashing sign in neon lights blaring music in my ear. This line was simple yet stood out in multiple dimensions. As I read this line, I thought this is it! Carol’s sentence combined with the Bible verse from John made such a beautiful connection in my mind and in my heart. I was absolutely flooded by the memories of those who have loved me with this kind of love. I have been overwhelmed by this kind of love in my life. I am overcome with the thoughts that are washing over me today. It brings me such joy, but at the same time such a deep regret that I take so much of it for granted on a daily basis. I am so selfish. I think about my friends in Christ. I am a woman rich in friendships, mountains of diamonds and rubies can not even come close to their worth. They pray for me. They pray with me. They let me pray for them. They care enough to really know me. Then they generously and lavishly use that information to love me. They sacrifice for me without thinking of themselves. They write cards that arrive at seemingly random times, yet are so divinely appropriate for the circumstances of my day. Their words speak such beauty that I can scarcely believe it yet I hold to it with everything that I have because it gives me hope. They take time out of their days to call me. They ask me questions about the events of my life. They inquire of my family. The ask me honestly about my struggles. They allow me to laugh or weep or be filled with mixed emotions. They email, text or facebook message me out of the blue. They drive hundreds of miles round trip just to have coffee and conversation with me. They open their homes to my visits at all times and circumstances. They bless me with the coolest gifts. They have given me blank journals and encouraged me to fill its pages even if I am the only one who will ever read the words. 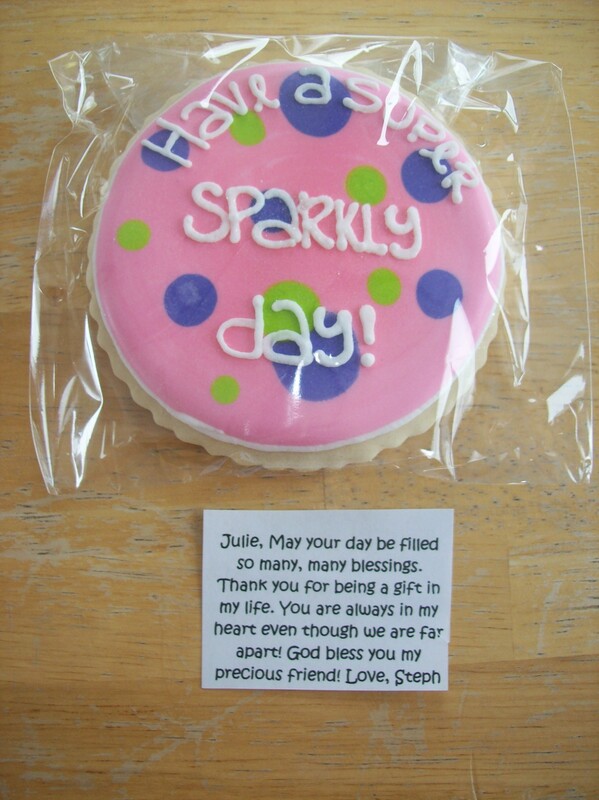 I received a little box in the mail one day and inside was this incredibly frosted cookie and a beautiful little note. It’s one cookie, but it made me feel like one of the richest people on the planet. I can not talk about knowing that I am loved without sharing this story. One day, I was at work on my way to a meeting. I arrived and realized that I had forgotten something in my office. As I walked to my office one of my dear and sweetest friends walked through the front door. She had in one hand a vase of daisies. Wrapped ever so perfectly around the vase was a bow made of purple ribbon. In the other hand she held a card she had written to me. When I walked up to her she threw her arms around me and hugged me. She asked nothing of me, she shared a few words and sent me back to my meeting, but she filled me with a hope that overwhelmed me. At this point it seems like this is a beautiful random act of kindness. But like Paul Harvey used to say on his radio show, here is the rest of the story. That day was January 6th, 2011. At 6:15am that morning I wrote this entry in my journal. (Yes, I often write the time down that I start a journal entry). God I want to quit! I've got nothing left in me but tears and hurt. I feel helpless and alone. I'm trying God. I'm pushing and pushing. I'm trying to be fast and slow. I'm trying to be relational and trust you. God I just don't understand. I don't feel right for this, as if I have been set up for failure. If it is Your will for me to fail, can we just get it over with. Is this refinement by fire so that I will be made more like you? This bitter, sad and questioned entry in my journal is not often something that you would find in one of my morning entries. I am a morning person. To me things always look better in the early morning light. You can tell this day did not start off with me noticing joyous rays of sun and singing birds. This is the kind of this that I would write at night when I was exhausted and burned out just before falling asleep. It gets even more amazing. Purple, like the ribbon, is my favorite color. I am drawn to it like a moth to a light. There is just something about the color that captivates me. Daisies are my favorite flower. They are more than just something I enjoy, they are so much more precious. When I see a daisy, it is my trigger to stop and remember how much God loves me. There is no doubt in my mind that these friends are followers of Christ. I know because I see and feel the love of Christ through them. They are hands and feet in this world to me. I hope that I, too, can love people like they have loved me. I am so sorry for all of the times that I have hurt them, ignored them and just not loved them the way they deserve to be loved. I am sorry for the times that I take them for granted or demand something from them. To all of my friends who are reading these words, I love you. I treasure you. I cherish you. I am grateful for you. I am praising God because of you. Thank you for showing Christ’s love. I know you are a disciple by the way that you have shown love to me and so many others. It is my prayer today that you would know it, too. Thank You so very much for the amazing friends that You have blessed me with. Lord, I recognize them as Your disciples. I praise You for them. Thank You! Thank You! Thank You! Thank You so much for making them so beautiful, so wonderful and so filled with love. Lord, I ask that You would bless them in this day with love, showered upon them through fellow disciples. Please use the people in their lives to fill their cups to overflowing. Help them to know beyond any doubt that they are loved. PS if you have a story about how a disciple of Christ showed love to you, please feel free to comment and share them. It is amazing how much hope good stories can bring to others.